Here's a quick view from our "office window" yesterday. 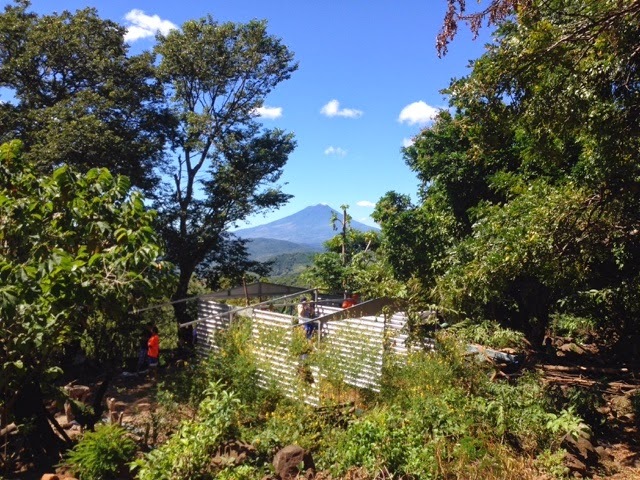 We built two homes in a remoter than remote village at the top of the highest peak between San Felipe and Rio Frio. There is such incredible beauty as we can look out and see the volcano, look beyond and see the ocean, look down and see the patchwork pattern of farmland in the valley below as the rio Lempa winds its way through. Spectacular. And more importantly so are the people. Hopefully tonight I'll be able to formulate some thoughts that we shared together last night in our team meeting regarding the beauty of the people and how they are reflecting the Gospel. Thanks for praying. It must seem like such a "miracle" for the recipients to see these houses being built.